My son is not a chocolate lover. If he did not look exactly like me, I might question if he was truly part of our family. 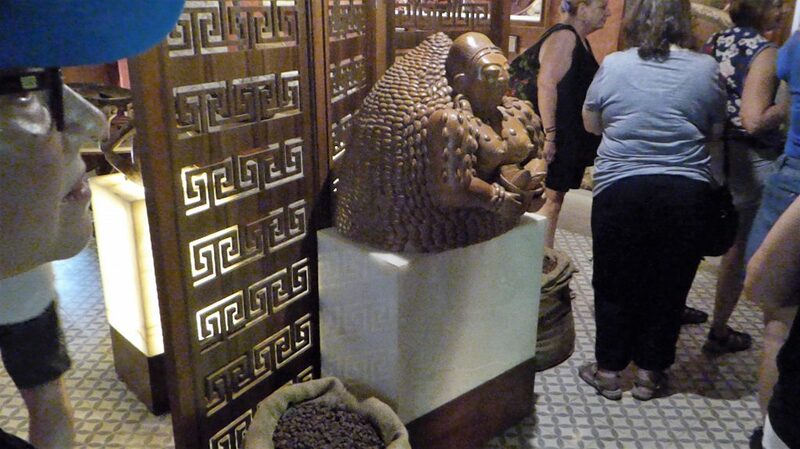 I was therefore surprised when he expressed interest in a tour of the Mayan Cacao Company in Cozumel, Mexico. After all, we would sample chocolate — lots of it. Could he enjoy the tour? Would he enjoy sampling chocolate in all of its form? Would he be disappointed that we signed up for this tour? He thoroughly enjoyed the tour and sampling the chocolate. We enjoyed learning about the history of chocolate and the role it played among the Mayan people 1000 years ago. Finally, we learned a simple recipe for home-made chocolate. 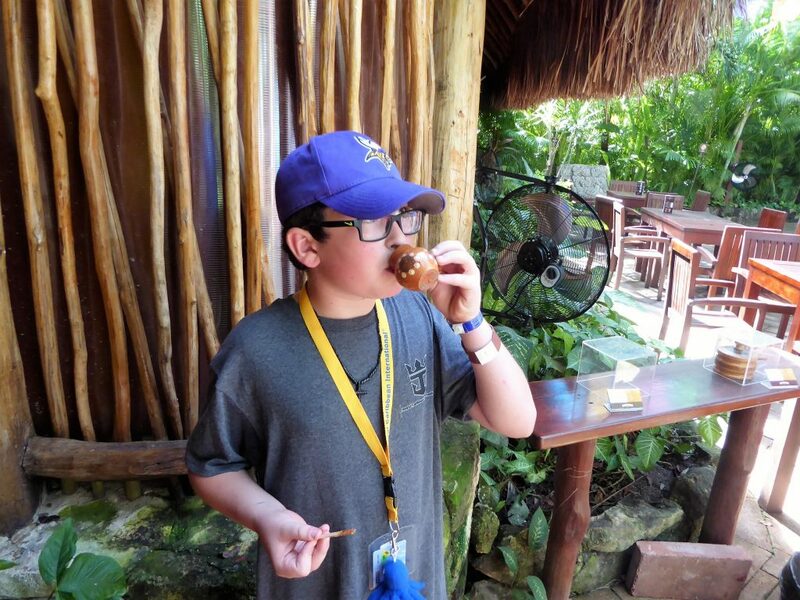 Surprisingly, me son counts the tour of the Mayan Cacao Company as one of his favorite activities during our recent vacation. 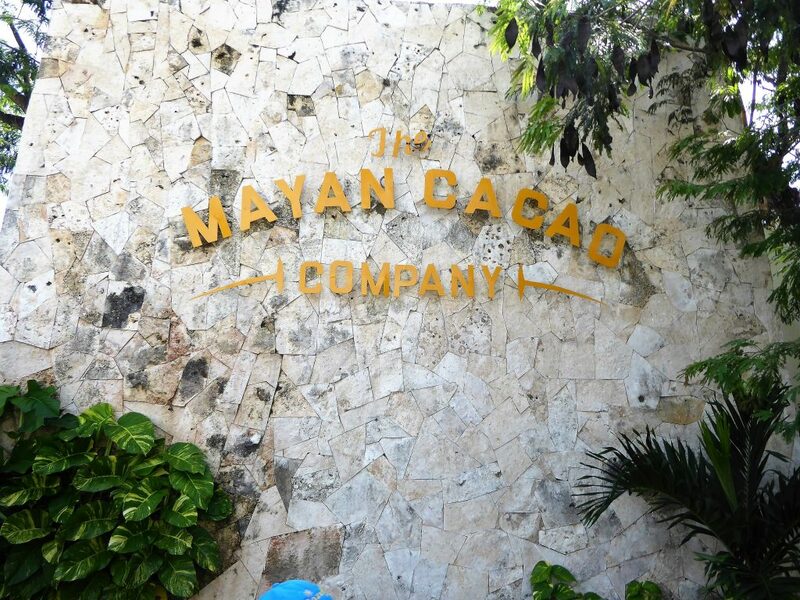 The Mayan Cacao Company is on the southwest corner of the island of Cozumel. There is one main road, with a secondary road that bisects the island. 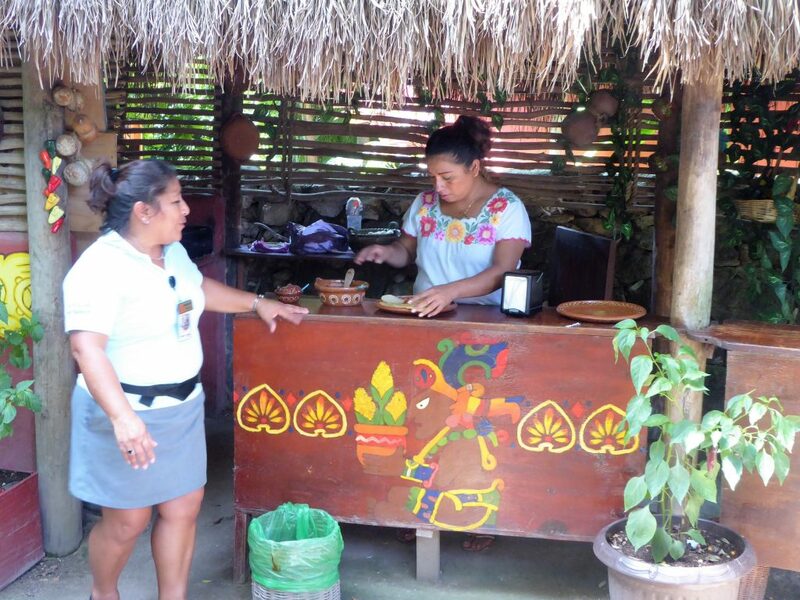 So, getting around the island in general and to the Mayan Cacao Company specifically is simple. We were on a bus tour of the island, but catching a taxi from San Miguel, Cozumel’s only town, is simple. A taxi ride to the chocolate company from the cruise ship ports costs about $12 USD and takes about 15 minutes. The Cacao plant is not indigenous to Cozumel, or Mexico. The plant grows in the rain forests of South America. However, the Inca and other South American people traded the cacao with the Mayan people. Both the pulp and seeds are bitter. However, the Mayan made a bitter drink with the cacao seeds, chili peppers and water. The poured the liquid from cup to cup until a froth was formed. They added local honey (there is no sugarcane on Cozumel) to sweeten the drink. The cacao seeds, known as “food of the gods,” played a critical role in Mayan religious ceremonies and marriage ceremonies. Artwork on stone structures and artifacts reveal cacao pods and Mayan gods consuming the bitter water. The beverage was consumed by peoples of all social strata. It is clear that cacao was important to the Mayan culture. Our tour of the Mayan Cacao Company lasted about one hour. This included time to buy chocolate and other souvenirs. Some people on the tour also purchased chocolate margaritas. The tour started with a traditional Mayan greeting. Dressed in Mayan clothing and body paint, our host sang the greeting in Mayan. The greeting and blessing also included him blowing in a conch shell and waving a container of incense during the song. A nearby macaw looked on during the ceremonial greeting. We proceeded to a wood hut where we learned about the history Mayan chocolate. The room includes a statue depicting the goddess of cacao. The mythology describes the goddess, Ixcacao, having humble origins as a fertility and earth goddess. She played an important role in early Mayan culture, which was a matriarchal society. When the Mayan raised up kings, and the society became more patriarchal, her role diminished. She provided the food of the gods, chocolate, to the patriarchy. Here we saw signs highlighting the trading or barter value of chocolate among the ancients. Forty beans bought a donkey, 100 beans a slave. Maps illustrate the trade routes for cacao. 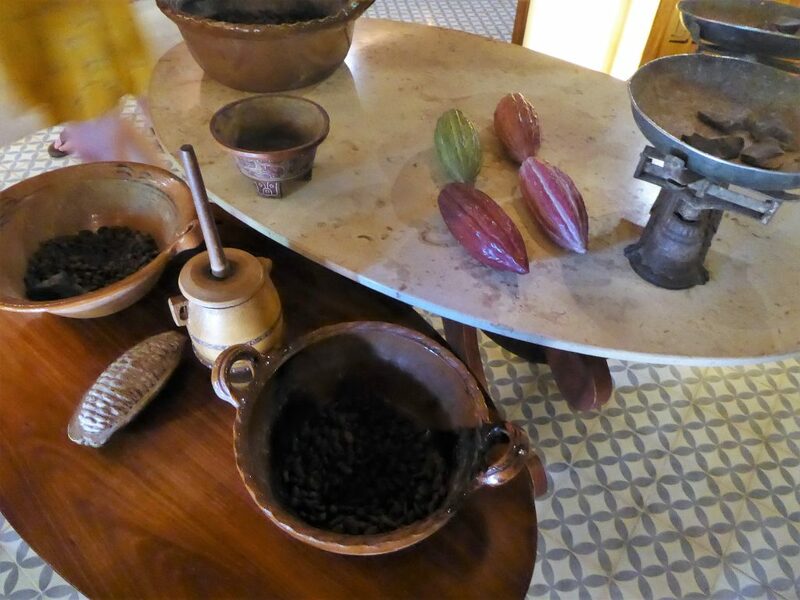 The room also includes replicas of the cacao seed pod and tools used for harvesting and weighing the beans. After leaving the hut, we got our first taste of chocolate. At an outdoor oven, a woman made tortillas and fresh mole sauce. Mole is a spicy chocolate sauce used in many Mexican dishes. The hot tortilla and mole took a a minute to cool down, but tasted wonderful. Preparing mole and tortillas for us to sample. This was my son’s first opportunity to sample the chocolate in any form. He enjoyed the mole tortilla and asked for a second helping. After walking through some tropical forested pathways — where our tour guide unsuccessfully attempted to get the macaws to talk, we made our way to a traditional Mayan structure. This was a round hut constructed of wood with a palm branch roof. 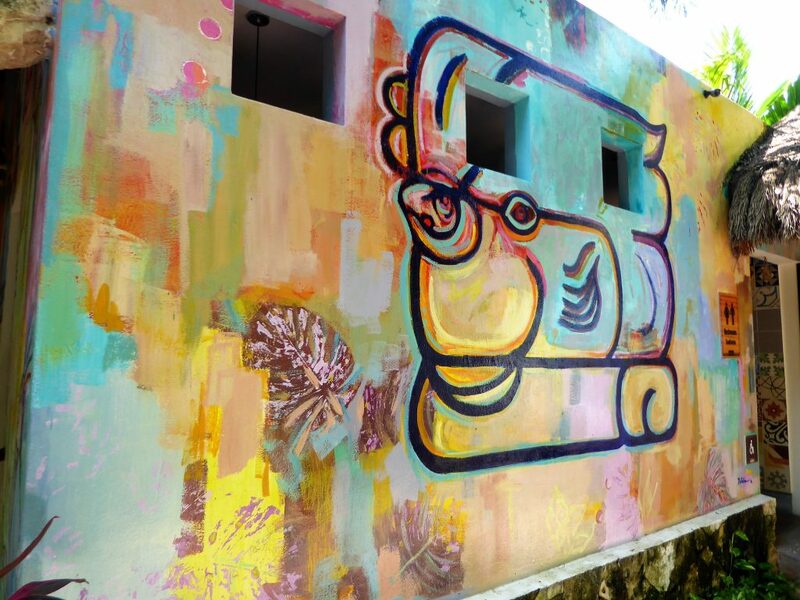 This style home is still found among the Mayan descendants. Our tour guide told us that her childhood was spent in a similar structure. The palm branches create a waterproof ceiling for the home, and the structure resist the fiercest of tropical storms. The centerpiece is an altar to the dead. 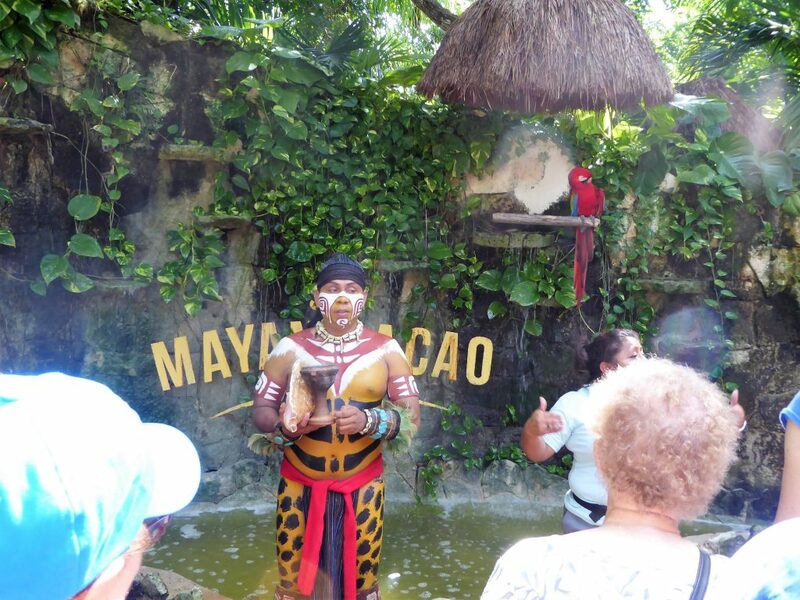 The guide explains the important role of the dead in Mayan and Mexican culture. Of course, the Dia de Los Muertos, or Day of the Dead, is the famous celebration which occurs November 1. 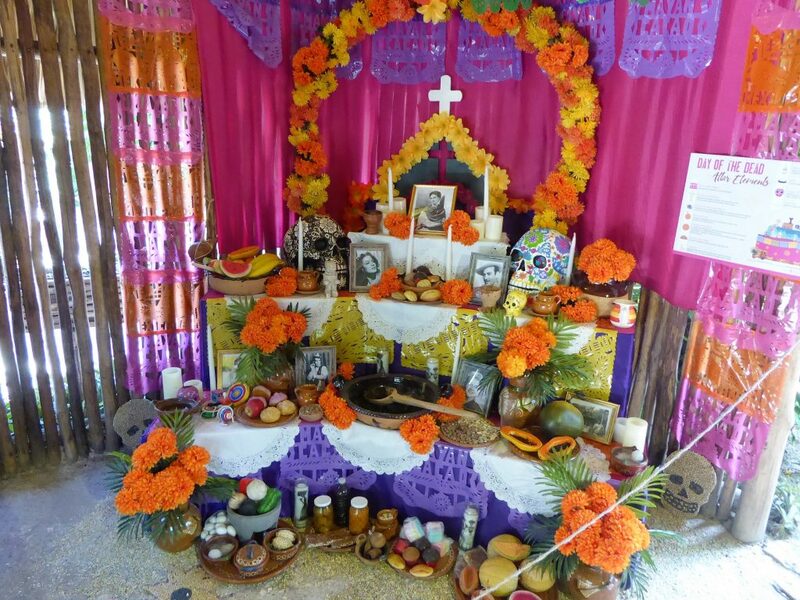 This altar included images of famous Mexican artists. The home and altar were adorned with orange mums, the flower associated most with Dia de Los Muertos. Next, we entered a building where we got to see the chocolate-making process. As we entered, we got to sample some natural chocolate on a stick. This was a dark chocolate without a lot of sugar. Some in our group disliked it, but my son and I enjoyed it. We then heard a presentation from Gabriel, who calls himself the Mexican Willy Wonka. Gabriel explained the chocolate samples were from a batch he had just made and then walked us through the process. The recipe is similar to the Mayan recipe. Our guide to the world of chocolate making. In addition to the bean, Gabriel explained six additional ingredients. He did not use measuring spoons, but poured in the ingredients by hand. The six additional ingredients are all spice, cinnamon, paprika (for coloring), sugar, honey, and vanilla. We love nothing more than Mexican vanilla. After adding the ingredients, Gabriel used a mortal and pestle to grind the ingredients, adding a splash of water. Then, he took the concoction adding warm water. He demonstrated the process of pouring the bitter water from cup to cup until it frothed. After leaving this building, we tried some of the bitter water. Although I could stomach it, my son needed to add some additional sugar, cinnamon, and honey before he could drink the mix. After all of this touring, it was time to sample and buy chocolate bars. 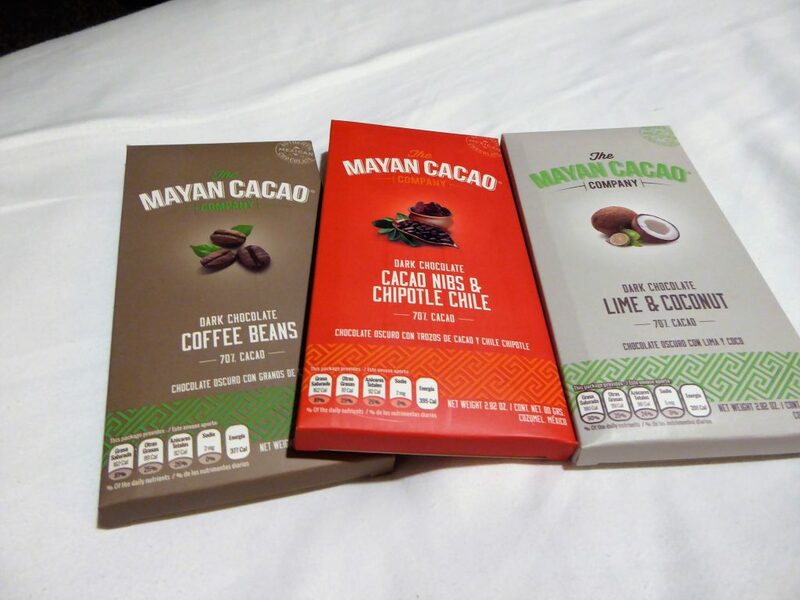 The Mayan Cacao Company produces 12 chocolate bars. You can sample and purchase each of the 12 styles in the gift shop. Believe me, we sampled and sampled. We enjoyed all of the varieties, but especially enjoyed and purchased one with coffee beans, one with lime and coconut, and one with chipotle chili. The chipotle mix has a strong kick, but we liked the combination of flavors. Each bar costs 152 pesos, which is about $8 USD. Our trip to Cozumel’s Mayan Ruins at San Gervasio. Learn all about our natural world at Denver Museum of Nature and Science. I’ve always wanted to do this! My coworker did it on costa rica last year and i was so envious! He made his own chocolates!! It was really enjoyable. We haven’t yet made our own chocolate, but now that we have a recipe we need to. It’s so cool that your son loved dark chocolate, it’s the healthiest and the best! And they’re right: cacao and chocolate come from South America. It’s funny how some people we met in Peru and Bolivia thought that cacao comes from Mexico… our guides kept saying that it’s from South America. haha… So much chocolate did you end up buying ? During your one hour visit, it must have smelled soooo damn good of cacao, right? I love dark chocolate and would love to come here just to check out their style of dark chocolate. As a marathon runner I love eating healthy but I love a sweet treat now and again. I love a bit of cinnamon in my chocolate now and again just to spice things up a bit. What an interesting tour! I love chocolate and I love margaritas; I’m not sure about the two together but i would love to give it a go! And that icon of the cacao goddess – I dont suppose it was made of chocolate? Just wishful thinking on my part! Seriously though, this sounds like a fascinating visit on which you learned a lot. I’m pleased your son was sufficiently open minded to give it a go too. 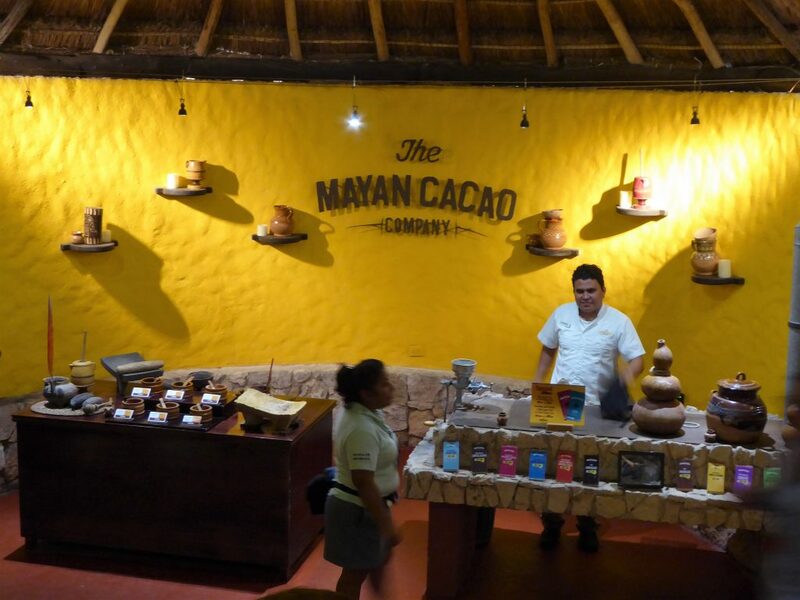 Of all the times I’ve been to Mexico, I haven’t been to the Mayan Cacao company. So interesting they traded with the Incans, but I’m not totally surprised. I also found it interesting that your son isn’t a chocolate-lover but he liked the dark chocolate. I’m one of the biggest chocolate -lovers on the planet and dark chocolate isn’t really my thing. So maybe your son doesn’t like really sweet stuff? Isn’t learning about the chocolate making process cool? We did that in Switzerland I also like that they showed you a traditional Mayan home! 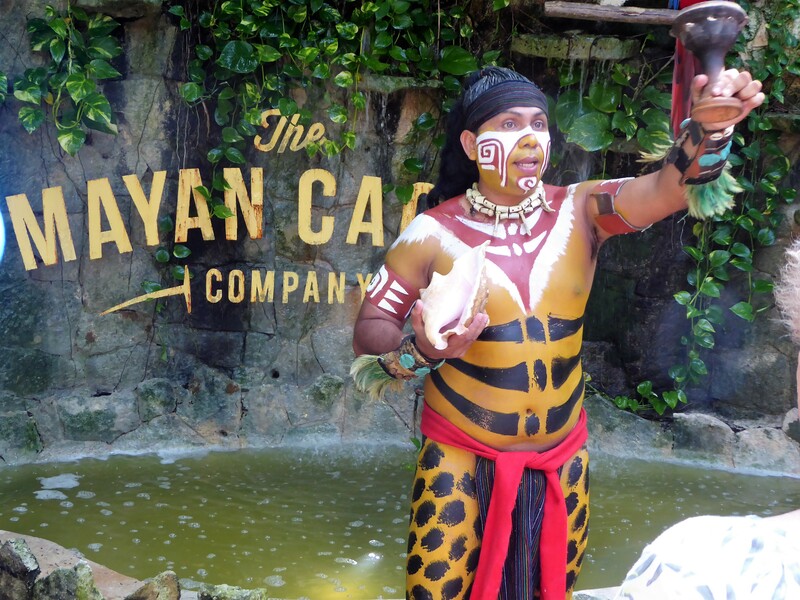 Learning to make chocolate with the Mayan Chocolate Company sounds like an enjoyable experience. And live mole too…I’m all in! To think that 100 beans were once enough to buy a slave! I’m not a huge fan of chocolate either, but I can see myself enjoying this tour. I love learning the history behind the product and tasting the different samples is such a fun part of the tour. I have never heard of a chocolate margarita and wouldn’t mind trying that either! What a cool and fun experience! This is definitely on my list for the next time I’m in Mexico! 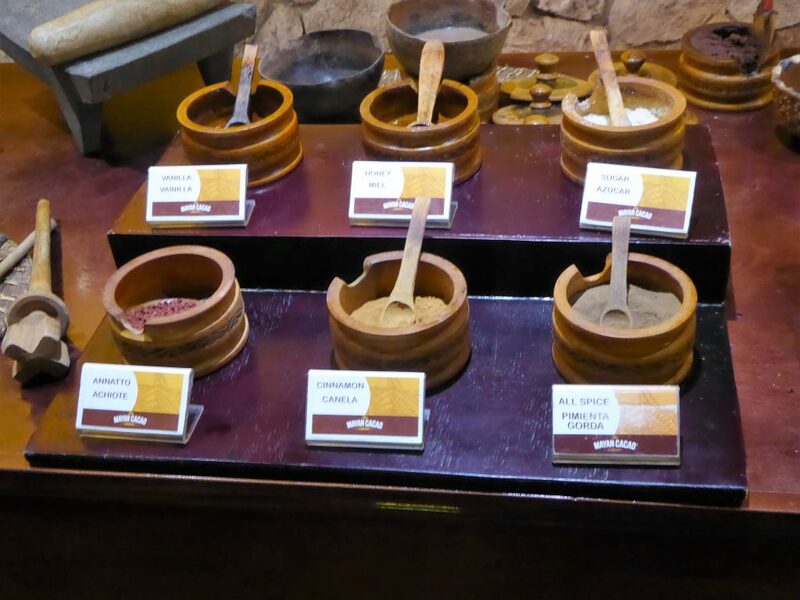 I love that you get a ton of history, get to try the cacao in different forms and also try Mole! Thanks for highlighting this unique place – saving for later! Wow, visiting an authentic chocolate factory must be such an interesting tour to do. 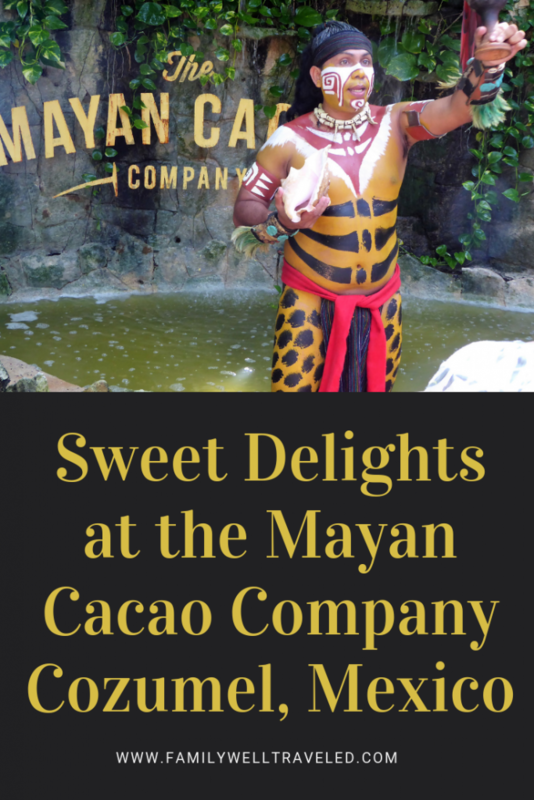 I love chocolate and would love to see how they are prepared at the local Mayan Cacao company. Traditional Mayan home look very unique too. Perhaps your son has not liked chocolate before because he had yet to sample real craft chocolate, the kind the Mayan Cacao company makes. Dark chocolate is where it is at for me … milk chocolate is simply too sweet and sugary. And dark chocolate liqueur (not recommending for your son of course, yet) is amazing. And of course, always been a huge lover of mole! Mmmmmmm good. It is such a delight to see chocolate made. I have seen the process once before in Costa Rica but I think if in the area of Cozumel that I would be at the Mayan Cacao Company in a heartbeat. I think you had me at tortillas and mole sauce. Sign me up! I will also gladly sample a dark chocolate bar with lime and coconut. Sounds like heaven!